How Do Collaria oleosa and Brachiaria spp. Respond to Increase in Carbon Dioxide Levels? 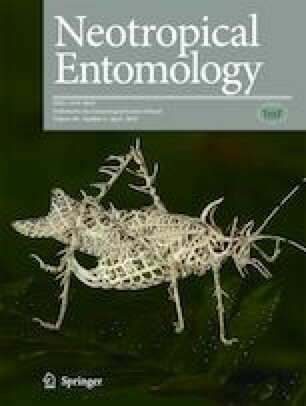 The current study determines the indirect effect of CO2 level increase on Collaria oleosa (Distant, 1863) (Hemiptera: Miridae) fed on Brachiaria spp. (Poaceae), at two trophic levels, and evaluates resistance to these forages against the insect pest. Mirid bug nymphs and host plant were maintained under four climate environments: (1) nymphs and plants kept at 400 ppm CO2 level; (2) nymphs kept at 400 ppm CO2 level and fed on plants grown at 700 ppm CO2 level; (3) nymphs kept at 700 ppm CO2 level and fed on plants grown at 400 ppm CO2 level; (4) nymphs and plants kept at 700 ppm CO2 level. A totally randomized design was employed with 50 replications. Mean duration and survival of each instar and nymphal phase of insect, subjected to different climate scenarios and food sources, were evaluated. High CO2 levels promote changes in the plant, which trigger changes in the biology of C. oleosa, especially when the insects are kept at the current CO2 level. Moreover, since longer developmental period and shorter survival rates will induce the reduction of the number of generations and number of specimens, it may be underscored that B. brizantha species resistance will be maintained in future climate scenarios. Similarly, genotypes of B. ruziziensis demonstrated that they will be resistant at current and future CO2 levels. We thank the Conselho Nacional de Desenvolvimento Científico e Tecnológico (CNPq, Brazil) and Fundação de Amparo à Pesquisa do Estado de Minas Gerais (FAPEMIG, Brazil) for supporting our research. DMS and AMA planned and designed experimental work; DMS performed the experiments; DMS, AMA, and JCM analyzed the data; DMS, AMA, JCM, and SEBS wrote the manuscript.